Madison Lawrence is tired of her socialite upbringing and wants to escape the confines of her domineering father. A chance encounter with a mysterious German stranger sets her on a path that will bring her more happiness…and danger than she thought possible. Carsten Erlichman can’t forget the woman he nicknames his angel. Madison’s beauty shines both inside and out. Their chance meeting under the stars is the perfect setting. But one delicate kiss and twelve gongs from the clock tower later, Madison is forced to leave, and he fears they’ll never cross paths again. But God has a way of working out the most complex of problems. Madison collects angel figurines as a means of feeding her most precious memory. Little does she know that her collection will tangle her in a web of lies and danger. When Carsten appears at her office offering a renewed relationship and strong protection, she relishes the opportunity to finally get to know the man who stole her heart one chilly evening in Germany. But Carsten is harboring a secret, and Madison must discover the truth about her father, her faith—and Carsten before the clock strikes midnight again. Madison Lawrence tilted her face toward the inky starlit sky, closed her eyes and breathed in the chilly air. The night held a mysterious quality; she could feel it in her bones. A restless feeling resided deep inside her, reaching upward as if trying to grasp the stars above. She could sense it. This night had the potential to be magical. She wrapped her fur coat tighter against her slender body. The wind picked up, carrying on its tail a bitterness that seeped deep within, but she was so distracted she barely noticed. “I can’t take it anymore.” Madison heaved a sigh and watched her breath form a cloud that floated into the night. The cheerful sounds of the adults inside the museum behind her carried through the window. She was so tired of the parties. This was supposed to be a family trip, but her father, as always, had mixed business with pleasure. He was inside the ornate building now, probably making another toast to riches and fame. Madison blinked back tears, not sure if they were from the cold wind or the emotions boiling beneath the surface of her heart. She sniffed, still able to smell the remnants of spicy cinnamon and eggnog clinging to her garments. She had to get fresh air. Darting a quick glance left and right down the deserted city street, she decided it would be safe to walk just a few blocks. The streets were brightly lit; the lamps lining the roadside radiated miniature halos that blurred through her teary eyes. She began to walk. “I just want to be free,” she whispered, “Free from the questions, and the stares, and the reputation of being Teddy Lawrence’s daughter.” Madison loved her father, but sometimes, enough was enough. And tonight, she’d definitely had enough. In all her eighteen years, she couldn’t remember ever disliking her dad this much. She kept walking. Finally looking up from her stroll, Madison paused long enough to gain her bearings. She had been in Germany for almost three weeks, but she didn’t remember ever coming to this part of the city before. She thought she had been heading toward the city square, a tourist spot she had visited numerous times over the past several days. She must have taken a wrong turn, for she now stood before a giant, elegantly carved clock tower and a beautiful display of fountains. Despite the cold temperature, different levels of water splashed joyfully into the frigid air. She thought she recognized the garden across the street, but she wasn’t sure. Startled, Madison spun to see a young man slowly approaching. He couldn’t have been more than a few years older than she, but Madison tensed, ready to run if necessary. Surprisingly, something about his easy demeanor didn’t scare her. She relaxed. Hands resting casually in his jacket pockets, the man walked closer until he was standing right in front of her. She lifted her chin. “Or perhaps angels have no fear.” He grinned and something in Madison’s heart jumped. “No name, either?” The mysterious stranger asked with a strong German accent. His eyes sparkled with amusement, even in the dim light of evening. “It’s Madison,” she responded. “Madison Lawrence.” She wondered if the name would register with him. She half hoped it wouldn’t. He was handsome. Mysterious. Alluring. Broad and muscular, he stood several inches taller than Madison. Hair the perfect mixture of blond and brown covered his head in a windblown sweep that brought attention to his startling clear blue eyes. Whiskered stubble covered his lower jaw, giving him a rugged, outdoor look that was far different from the perfectly groomed dates that often swarmed Madison’s door. “The very same,” Madison admitted between clenched teeth. She mentally kicked herself. She should have kept her name a secret. Would she ever learn? “Ja, tanzen. Dance.” He easily hopped onto the little wall surrounding the fountains and held out his hand. Everything in Madison’s head told her this was ridiculous, that she shouldn’t be out with a stranger this time of night, or ever, really. She had no clue who this man truly was or even his name. “There’s no music,” she protested, as if that were her biggest hesitation. She wiped her palms down the sides of her fur coat then regretted the action. Her mother would have a fit. Madison took a deep breath. Why did it suddenly feel as though the temperature had risen fifty degrees? She blinked. It was beginning to snow. “Give me your hand,” he coaxed. And for some reason, she did. Pulling her carefully onto the wall, he placed one hand lightly on her waist and held her other firmly in his. “Just feel it,” he whispered, beginning to sway back and forth. Madison, almost against her will, found herself moving with him, swaying to and fro on the fountain wall with her very own fairytale prince. He began to hum softly, a nameless tune that brought strange comfort to Madison’s heart. She closed her eyes and moved closer, enjoying the feel of his strong arm under her hand and the soft tendrils of hair that curled over the nape of his neck. Her gut screamed at her that this was crazy, complete and utter nonsense. Her parents would be livid. She knew better than this. But her heart had long since told her to be quiet. Time seemed to stand still. They continued to dance on the wall, twirling, swaying, and moving to music only they could hear, in a rhythm only they could feel. The hem of Madison’s red party dress fluttered in the breeze, and her hair lifted in the wind. “Like a halo,” he whispered. 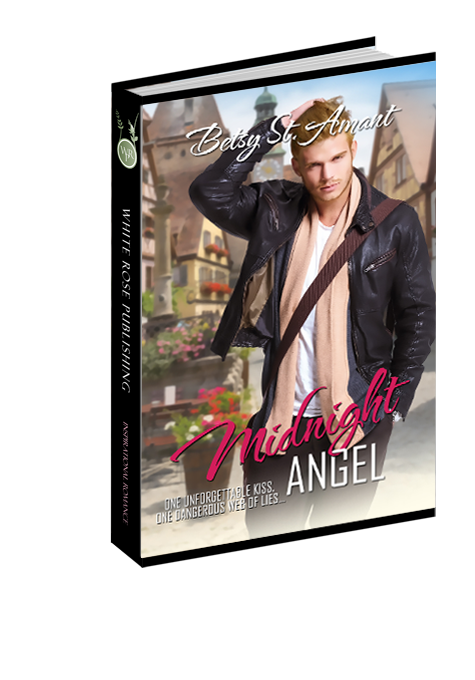 “You really are an angel, Maddie.” Catching her waist, the handsome German brought their dancing to an end and gently cupped her face with his free hand. Madison’s breath caught in her throat at the nearness of him, this stranger with whom she felt such an instant connection. She blinked, and snow fluttered off her eyelashes. This was absurd. Was he going to kiss her? His gaze locked with hers, then trailed down her face to her lips, then back to her eyes. Warmth draped Madison’s body until she no longer felt the cold night air. She stared back, unable and, at the same time, unwilling to break the connection. Leaning closer, he brushed his lips lightly against hers, so softly that Madison wasn’t even sure it had happened. He kissed her again, and this time Madison was sure. The touch of his lips against hers brought such a feeling of completeness, Madison was certain a part of her would be missing once they broke away. He lowered his head, kissing her more deeply, and Madison cupped her hands around the back of his neck. An hour passed, or possibly a minute. She wasn’t sure. But none of it mattered—not her parent’s inevitable reaction and panic, not her own absence of common sense. Nothing else existed. Just her and her mysterious prince. Chiming from the clock tower sounded across the courtyard, and she broke away, gasping for breath and more than a little dizzy. “What time is it?” She gasped again and stared at the clock tower unable to comprehend what the pointing hands meant. Her head spun. “Midnight,” he said, loosening his hold on her waist but not completely letting go. “I have to get back.” Madison ran her hands briskly through her hair, feeling as if she had just been through a time warp. Was this a dream? How long had she been gone? Her parents would be wild with worry. But then, she didn’t really care, did she? “Will mein engel turn into a pumpkin?” Her mysterious stranger teased. He leaned forward and rested his forehead against hers. Madison fought the instinct to stay in his arms and carefully stepped off the fountain wall instead. Madison hesitated, considering her options. She could stay at the fountain with this handsome stranger, or she could do her duty as a daughter and heir and return to the party with her parents. Her heart twisted and shouted an instinct that Madison quickly rejected. “I’m sorry,” she replied, still backing away one step at a time. “I have to go.” She wished her heart didn’t hurt so badly at the thought. She turned and walked faster. She froze and then slowly turned around. “My name is Carsten.” He repeated, softly this time. Madison rolled the name around in her head, loving it more with each second that passed. Carsten. Her very own German prince, Carsten. “We shall meet again, my angel,” he called out. Madison lifted her hand in a wave, and then held it closely over her heart as she turned and walked three more steps away. Risking a glance over her shoulder, Madison blinked.